Brooke (second left) with (from left) Jong, Liza and Pauline pose for a group photo during the visit. 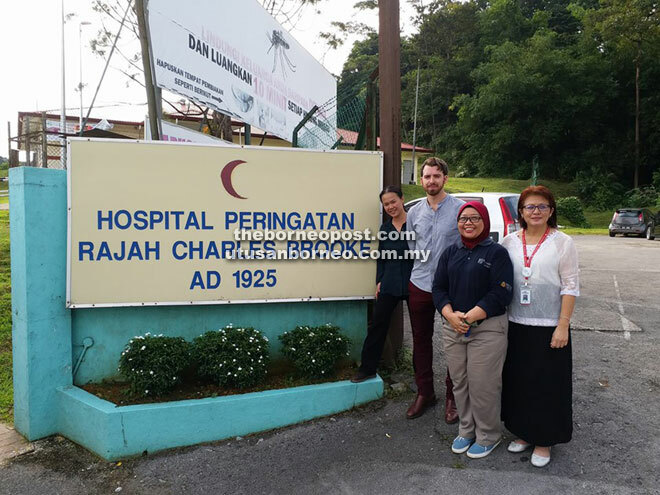 KUCHING: The Heritage Society of Rajah Charles Brooke Memorial (RCBM) Hospital was honoured with a visit from the Brooke Trust director Jason Brooke and Brooke Gallery, Fort Margherita general manager Liza Sideni last Wednesday. On hand to receive them were society president Angelina Jong and secretary Pauline, said a media statement yesterday. The visitors were briefed on the history of leprosy in Borneo and the eventual inception of RCBM Settlement in 1925. They later toured the mini museum and walked the grounds of RCBM Hospital, which is currently in the midst of being gazetted as a heritage site. The RCBM Hospital is the only leprosum in the whole of Borneo and the oldest in Malaysia, according to the statement. Founded on Oct 10, 1925, RCBM Hospital had been home to many Hansenites from different races and faiths. “It, too, had borne witness to many tears and broken hearts — the unjust cruelty that was faced by them decades ago, to be shunned and ostracised by their very own community and loved ones. “The stigma, unfortunately, is still stubbornly strong in this modern era. Many of us would still shy away by the sight of a Hansenite (sufferer of leprosy) more so when there are disfigurements and physical handicaps,” said the statement. The society aims to create public awareness of this issue and publicise the fact that although Hansen’s Disease (commonly called ‘leprosy’) is not eradicated, it is completely curable now and early treatment would leave no marks. “History must never repeat itself again,” the statement stressed. The society will be able to collaborate with the Brooke Heritage Trust in preserving and conserving the heritage grounds of RCBM Hospital as well as the documentation of oral histories from a handful of Hansenites still living in the neighbouring village. The society also welcomes any agency or non-government organisation (NGO) interested in their efforts, to work together in preserving the state’s heritage for the future generation. They can contact Jong at 013-8288754 or visit Facebook page https://www.facebook.com/HSoRCBMH/.